Cycle paths and footpaths provide safe routes for pedestrians and those travelling by bicycle. Being separate from cars, vans, trucks and other vehicles on a dedicated route makes for a more pleasant journey. According to the UK Government Department for Transport’s Cycling and Walking Investment Strategy, the case for investing in walking and cycling is well established; making shorter journeys the natural choice by foot and pedal power have many benefits to society. Should Danish levels of cycling be adopted in the UK, it would save the NHS £17bn within 20 years. In transferring just 10% of journeys from car to bicycle, air pollution would be reduced, and it would save 400 life years. It is not just pedestrians and cyclists who can enjoy a smooth automobile free pathway. Those who rely on wheelchairs, mobility scooters, or parents with pushchairs and prams can make their way to their destination without encountering obstacles like kerbs, steps and other obstructions. These types of environments are more inclusive in their access credentials. In its 2017 report, the Department for Transport outlines financial and health opportunities, especially for children and young people. Cycle paths and footpaths provide the opportunity to foster and develop good lifestyle habits in the younger generation. More than 9 out of 10 children live within 15 minutes of a primary school on foot (or by public transport), with three quarters of children living within a 15 minute cycle journey of a secondary school. For the overall community, two out of three trips are less than 5 miles and more than 8 out 10 people live in urban areas where most journeys could be cycled or walked. Nationally, the gross cycling contribution to the UK economy in 2010 was £2.9billion, showing that providing opportunities and encouraging people to get on their bikes is also financially beneficial. 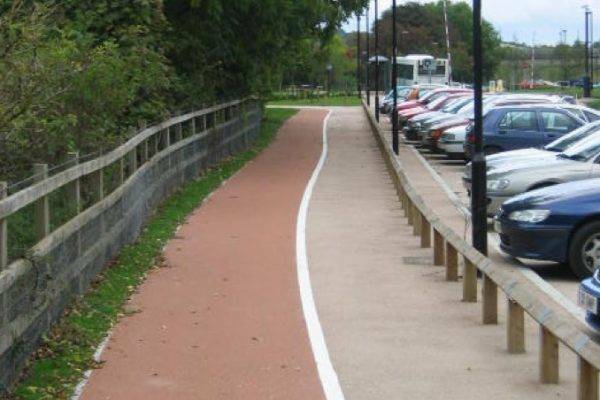 Local authorities and town planners wishing to invest in and improve cycle paths and footpaths as part of a town or city’s transport infrastructure will find the perfect coloured paving material in NatraTex. A highly durable alternative to resin bound aggregates, it has been used for cycleways and park footpaths around the country. Discover more about its excellent properties and performance with our FAQ’s. Alternatively, you can contact us to discuss your projects requirements further.